Internet Marketing Tools and books are necessary procurements. In any job or business you need to find the right tools for the right job. For instance, if you are a auto mechanic you need wrenches, sockets, screwdrivers, hammers, vacuum gauges, etc. But if you want to be a better mechanic, you need books for guidance, timing lights, voltage meters, compression testers and more. 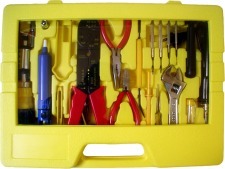 Internet Marketing Tools are just like mechanic tools. You need the right tools to accomplish the tasks of online marketing. Training to know what to do, more training to accomplish tasks more easily and the right tools to help you accomplish tasks more efficiently. Then I will introduce you to tools I recommend that you use and why they can be helpful. Every tool I’ll recommend I use or have used. All will be well worth the money if you decide to purchase any of them. I WILL NOT list tools just so I can get a commission. In any business, you need to make choices on what type of business you want to do. The favorable thing about internet marketing is that there are a number of areas that can supply you with re-occurring streams of money. In all of your business choices you’ll need to find a area of interest that you want to pursue or ‘niche’. For most cases in internet marketing you will need to build your own website(s). However if you go into niche marketing, some marketers will supply you with a website that you can modify to your taste and in some cases will even supply you with products and links. Instead of me giving you an overview of every method of marketing in one place, I will cover each individually on separate pages in this area. I hop that you find this area beneficial to you in making your business choice as well as learning the many methods of marketing and the marketing tools that you can use to save you time and money in the long run. I have more overall Internet Marketing and Method training available on my Making Money on the Inter.net website.